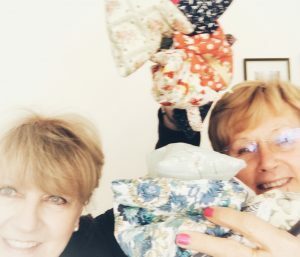 This lovely lady called Linda Dobbs loves to sew and with fabric, bought by she and I, she is making these adorable little bags which I will fill with PERFUME, TOILETRIES and general HOTEL MINIS (that we all bring back from hotels after our hols – and don’t use!). SORT OUT YOUR DRAWERS GIRLS! 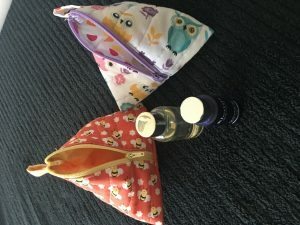 Find those mini shampoos and hand creams as well as perfume samples. They must be new and unopened. I will fill the bags and give them to HOMELESS or POOR women in UK who may really appreciate a little treat just for themselves. Most of us have so much , let’s share it around? I want to share what I have with others who aren’t so fortunate and I want to encourage you to do the same! PLEASE try to donate some New KNICKERS to me and any MONEY you can afford. I hope to be able to treat some of these women. It’s early days and so not sure where I’m going with this but I can guarantee that it will be worth doing and will be fun too! Email me if you can help! Also, if you wanted to donate to the KNICKERLADY sanitary Towel project in Zambia, I can still pass over KNICKERS or MONEY to the people now organising that.